Welcome to the Hemispheric South/s Website! We’ve also added a Featured Book page to bring you the latest in groundbreaking scholarship. In the 2011-12 academic year the Hemispheric South/s Research Initiative (HS/s) took up the question of Oceanic Connections and Movements. Highlighting the importance of fluidity, migration, and exchange to transnational and hemispheric research, this year’s programming will look at these connections through work by and about people of color at various oceanic points. Speakers and events represented nations and populations situated along bodies of water that define Global and Hemispheric South/s. Trans-oceanic resonances were particularly important in this year’s programming. Events outlined below, describing some of our programming, include collaborations and co-sponsorships with research units across campus that share Hemispheric South/s’ commitment to enhancing and complicating discourses of race and ethnicity in the Department of English and on-campus. Significant in this cycle of programs is the 2nd Annual Bodies in Space graduate conference organized by Kristie Soares, HS/s Research Assistant, Shannon Brennan, Literature and the Environment Research Assistant, Alison Reed, Incoming HS/s Research Assistant, and Jessica Lopez-Lyman, Chicano Studies Department. This graduate student driven conference recruited proposals and participation from graduate participants throughout California. It featured two keynote presentations: a master class by theatre artist Sharon Bridgforth and lecture, “Performing Precarity” by Dr. Jennifer Brody. 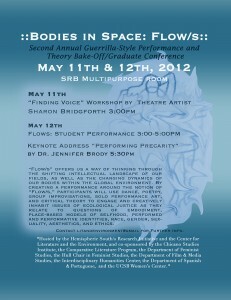 For this demanding event conference participants brought their research interests to bear in a trade of ideas, argument, and theory from which they collaborated to produce and present their own original new art–performances that engaged and critiqued practices of knowledge production. This year’s ::Bodies in Space:: conference video (filmed by Ali Lassoued and edited by Emanuel Garcia) is now available online here. Amanda Phillips, graduate student, Department of English, penned a popular in-depth HASTAC blog post on the conference, which you can read here. Speakers and events represent nations and populations situated along bodies of water that define Global and Hemispheric South/s. Trans-oceanic resonances are particularly important in this year’s programming. Upcoming and proposed events include: a presentation by Ghanaian playwright Ama Ata Aidoo; a lecture by Professor Patrick Bellegarde Smith; Comparative Transnationalisms: a panel composed of new Women of Color faculty at UCSB; the Caribbean Crossroads Conference; and a week of graduate events, including a Graduate Panel and our 2nd annual Graduate Performance Conference. The Hemispheric South/s Research Initiative remains committed to enhancing and complicating discourses of race and ethnicity in the Department of English and on-campus. This conference explored the interactions and points of contact between the different cultural and linguistic zones that make up the Caribbean region, in support of a less insular, more archipelagic sense of Caribbean culture. Dr. Batiste discussed her new book, which examines how African Americans participated in U.S. cultural imperialism in Depression-era stage and screen performances. A population treated as second-class citizens at home imagined themselves as empowered, modern U.S. citizens and transnational actors by performing cultural and racial otherness in plays, operas, ballets, and films. Many of these productions, such as the 1938 hits Haiti and The “Swing” Mikado recruited large casts of unknown performers, involving the black community not only as spectators but also as participants. Performances of exoticism, orientalism, and primitivism are inevitably linked to issues of embodiment, including how bodies signify blackness as a cultural, racial, and global category. Surfing has been a significant sport and cultural practice in Hawai’i for more than 1,500 years. In the last century, facing increased marginalization on land, many Native Hawaiians have found refuge, autonomy, and identity in the waves. In his book Waves of Resistance Isaiah Walker explains that throughout the twentieth century Hawaiian surfers have successfully resisted colonial encroachment in the po’ina nalu (surf zone). 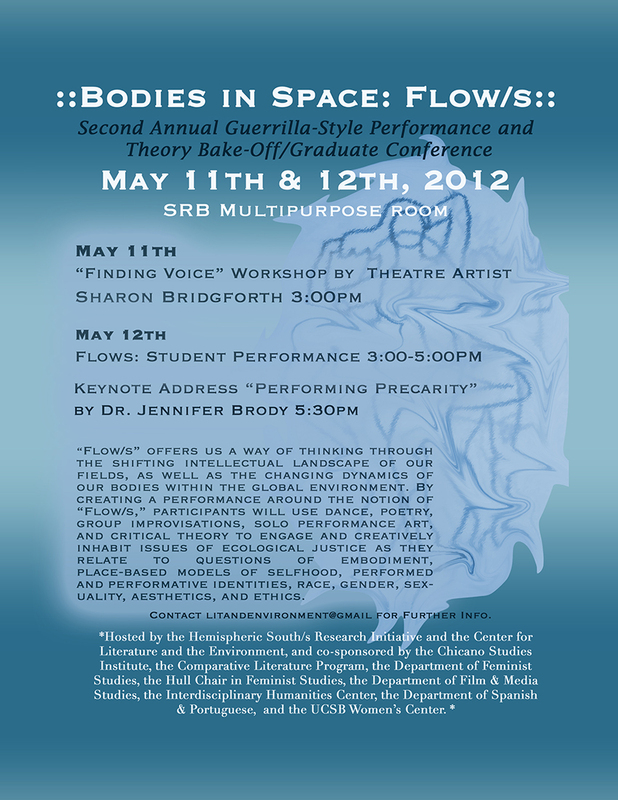 ::Bodies in Space: Flow/s:: was a two-day graduate event that began with a series of roundtables and ends with a guerrilla-style performance. Highlights of the program include a master class by poet, theorist, activist, and performer, Sharon Bridgforth (Duquesne University), and a keynote address by cultural critic Dr. Jennifer Brody (Stanford University). Located at the crossroads of Africa and the Indian Ocean, the port cities of the Swahili coast have been nodes of global connectivity for over two millennia. Beginning in the nineteenth century, however, Western imperialism radically reconfigured East Africa’s social, political and cultural networks. This talk explored the fundamental role of photography in remaking Swahili logics of personhood. It considered how the photograph, through its very materiality, circulated in and out of various registers of meaning in order to question normative ideas about the politics of globalism. This three-day conference explored the intricacies of Aidoo’s work and the broader questions of Diaspora and gender they raise. “A War Between Soldiers and Prophets”: Embodied Resistance in Colonial Belgian Congo.” A Talk by Dr. Yolanda Covington-Ward. Based on fourteen and a half months of ethnographic and archival research, this paper placed the body and embodied practices at the center of an analysis of Kongo colonial-era prophetic movements to examine spirit possession and trembling (kuzakama) as sites of moral and political contestation between the church, colonial state, and the indigenous population in the Lower Congo.